International Journal of Research in Health Sciences,2014,2,4,1021-1029. 1,2-Assistant professor, Department of Orthopaedics. 3-Senior Resident, Department of Orthopaedics. 4-Junior Resident, Department of Orthopaedics. 5-Assistant professor, Department of Anaesthesiology. 6-Assistant Professor/Lecturer, Department of Anatomy, KSHEMA, Nitte University, Mangalore. 7-Professor of Biochemistry, RIMS, Navodaya Medical College, Hospital and Research Center, Raichur, Karnataka, INDIA. Background and objectives: The spinal trauma is one of the leading problems in Orthopaedic practice more so in modern era where the individuals are more at risk due to high energy. It is one of the grave injuries that cause infinite morbidity and disability to the patient. Thoracolumbar spinal segment is the 2nd most commonly involved segment after the cervical segment in spinal injuries, about 30 to 60% of all spinal injuries. Materials and Methods: This is a prospective study of 21 cases of unstable thoracolumbar spinal injuries treated by posterior instrumentation in Navodaya Medical College, Hospital and Research Centre, Raichur between 2012 to 2014. Medically unsuitable and patients not willing for surgery were excluded from the study. Results: In this series 20 (95.3%) patients were male and 1 (4.7%) were female patients. In this series there were 13 (65%) of type A fractures, 5 (25%) of type B and 2 (10%) with type C fractures. In this series we had 10 (47.6%) patients with fractures at the thoracic level and 11(52.4%) patients with fractures at lumbar level. The T11 - L2 fractures contributed to 18 (86%) of the cases and were the most common fractures were at T12 (23.81%), L1(28.57%). . In this study 11 (52.38%) of patients were of grade A, 7 (33.33%) were grade B, 3 (14.4%) were grade C at admission. All patients showed at least one ASIA grade improvement at latest follow-up. At 3 months follow up 9(42.85%) were of grade D & E, at 1 year 13 (62%) of patients were of grade D and E. Conclusion: From this sample study, we consider that pedicle screw fixation is an excellent treatment for spine fractures. 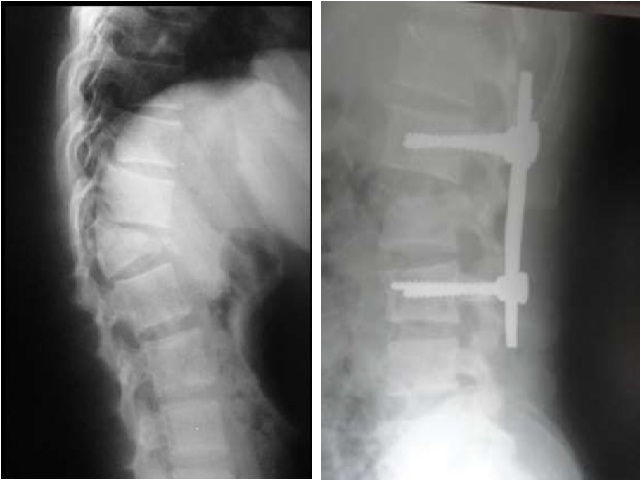 Pedicle screw fixation should be done as early as possible in order to facilitate neurological recovery, help in good nursing care and mobilization of the patient and to prevent deterioration of the neurological status. Pedicle screw instrumentation provides less surgical exposure, correction of deformity and better stabilization of one motion segment above and below fracture.